Psychologist Steven Pinker's book The Better Angels of Our Nature explains that the world is actually growing less violent, even though the media may give a different impression. As you know, we've been following the attack on the boardwalk in Nice and the attempted coup in Turkey, both of which claimed dozens of lives. But those are just two of recent violent episodes that shocked the world. There was also the assault on a park in Bangladesh and on the airport in Brussels, the suicide bombings in Baghdad, not to mention the spate of mass shootings here in the U.S.
You can see why reasonable people might wonder if the world is falling apart or at least becoming more violent. So we posed that question to Harvard University psychology professor Steven Pinker. He says the answer is no, a thesis he put forth in his book "The Better Angels Of Our Nature: Why Violence Has Declined." We reached him in Cape Cod, Mass., via Skype, and I asked him to explain his argument. STEVEN PINKER: The only way you can really answer the question - has violence gone up or down? - is to count how many violent incidents have there been as a proportion of the number of opportunities, and has that gone up or down over the course of history? And that's what I tried to do in the book. I looked at homicide, looked at war, looked at genocide, looked at terrorism. And in all cases, the long-term historical trend, though there are ups and downs and wiggles and spikes, is absolutely downward. The rate of violent crime in United States has fallen by more than half in just a decade. 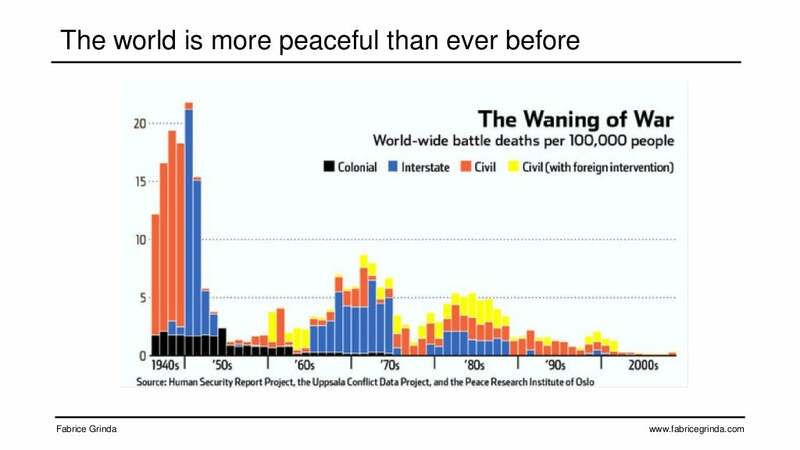 The rate of death in war fell by a factor of 100 over a span of 25 years. MARTIN: And you say this is a worldwide phenomenon. PINKER: Well, it's highly uneven. If you certainly choose the most violent parts of the world at any given time, they're going to be pretty violent. But if you count the number of parts of the world that are violent versus those that aren't, then you see that the world is becoming more peaceful. The impression that some kinds of violence have gone up over the last five years has some truth to it. Because of the Syrian civil war, the rate of death in warfare has drifted upward a little bit in the last five years. There has been a small increase in homicide in the United States in the last three years. But both of those figures are at a fraction of what they were in the '60s, '70S and '80s. MARTIN: Why is the rate of violence going down around the world? PINKER: There are a lot of individual whys because the decline of war, decline of homicide, decline of capital punishment, and so on take place over different time scales. If there's a common denominator - in the long run, violence really is irrational. I might get an advantage if I harm someone else for my benefit, but on the other hand, he feels the same way. And if we both are constantly trying to kill each other, we're both worse off. And certainly the police and government have had a huge role in reducing violence. In the international arena, of course, we don't have a global police force. And there it is partly dependent on institutions of cooperation that make it more profitable to trade with other countries than to invade them. You don't kill your customers. The rise of democracy has probably made a difference. Democracies are less likely to wage war against each other. And there's also been a change in norms, just what decent countries do or don't do. MARTIN: What would be the implications of embracing your point of view? You've heard, for example, the president sort of encouraging people not to panic. If we were to absorb that thinking, what do you think the implications of that might be? PINKER: I think the president is absolutely right. For one thing, we must not assume that society is falling apart. We're pretty safe. Remember that terrorists in particular, really, by design, distort our view of violence. That's almost what terrorism means. PINKER: The amount of damage that terrorists do in terms of the number of people they kill is a fraction of the number of people who die in ordinary day-to-day homicides. But they have hit on a formula for guaranteeing news coverage and guaranteeing the attention of the world. I actually think that is a pathology of journalism that because it is so driven by events that happen in a discrete moment in time, it often ignores long-standing trends that transform the world that you may not notice on a day-to-day basis. It also creates an opportunity for violence entrepreneurs who can game the system by making a presence on the world stage knowing that it is the sudden, dramatic, violent events that make it on page one or get the most clicks. MARTIN: That's Steven Pinker, professor of psychology at Harvard University, speaking to us from Cape Cod via Skype. Professor Pinker, thank you so much for speaking with us. PINKER: My pleasure. Thanks for having me. that society is getting more and more dangerous every day. How do you propose to get the mainstream media to change?